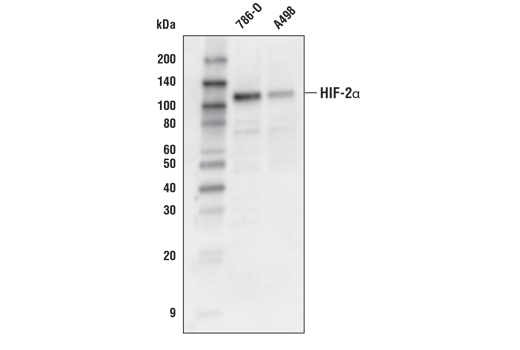 Western blot analysis of extracts from 786-O and A498 cells using HIF-2α (D6T8V) Rabbit mAb. Western blot analysis of Hep G2 cells, untreated (-) or treated with cobalt chloride (CoCl2, 100 μM, 4 hr, +) using HIF-2α (D6T8V) Rabbit mAb (upper) or β-Actin (D6A8) Rabbit mAb #8457 (lower). Chromatin immunoprecipitations were performed with cross-linked chromatin from Hep3B2.1-7 cells treated with cobalt chloride (100 μM) overnight and either HIF-2α (D6T8V) Rabbit mAb #59973 or Normal Rabbit IgG #2729 using SimpleChIP® Plus Enzymatic Chromatin IP Kit (Magnetic Beads) #9005. The enriched DNA was quantified by real-time PCR using SimpleChIP® Human PAI-1 Promoter Primers #33070, human EPO promoter primers, and SimpleChIP® Human α Satellite Repeat Primers #4486. The amount of immunoprecipitated DNA in each sample is represented as signal relative to the total amount of input chromatin, which is equivalent to one. For optimal ChIP results, use 5 μl of antibody and 10 μg of chromatin (approximately 4 × 10^6 cells) per IP. This antibody has been validated using SimpleChIP® Enzymatic Chromatin IP Kits. 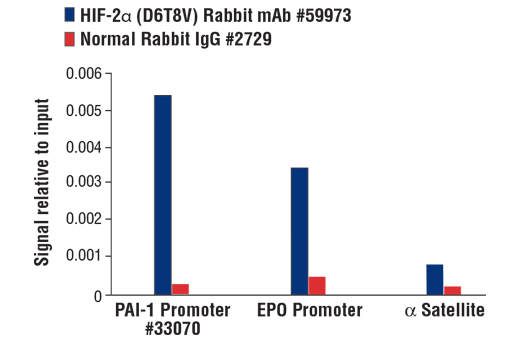 HIF-2α (D6T8V) Rabbit mAb recognizes endogenous levels of total HIF-2α protein. 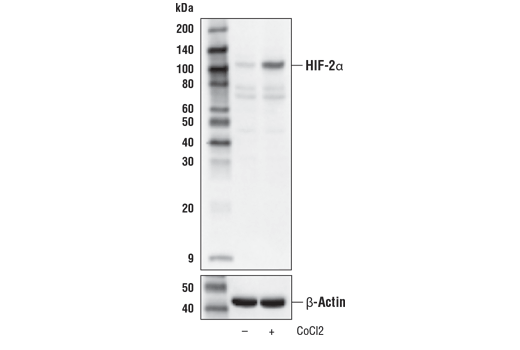 This antibody does not cross-react with HIF-1α protein. Monoclonal antibody is produced by immunizing animals with a synthetic peptide corresponding to residues surrounding Gly688 of human HIF-2α protein. Hypoxia-inducible factor (HIF) is essential for the cellular response to hypoxia (1,2). Under normoxia conditions, the α subunit of HIF is ubiquitinated by von Hippel-Lindau (VHL) protein and is degraded in the ubiquitin/proteasome pathway (1,2). Hypoxia inhibits the degradation of the α subunit, which leads to its stabilization (1,2). HIF, in turn, regulates the transcription of a variety of genes that respond to hypoxia conditions (1,2). There are several isoforms of the HIF α subunit (2). Studies have found that HIF-1α and HIF-2α expression is increased in some human cancers (2). HIF-1α has both pro- and anti-proliferative activities, whereas HIF-2α does not possess anti-proliferative activity (2). Therefore, HIF-2α likely plays an important role in tumorigenesis (2,3). Kaelin, W.G. (2005) Biochem Biophys Res Commun 338, 627-38. Toschi, A. et al. (2008) J Biol Chem 283, 34495-9. Gordan, J.D. and Simon, M.C. (2007) Curr Opin Genet Dev 17, 71-7.